Call Crown Trace FC: “The Alphabet Boys.” The Chaguanas-based outfit made a memorable debut in the East Zone Under-16 Division yesterday afternoon, as they ‘walked thru’ with a 3-0 win over FC Santa Rosa in Republic Bank National Youth League (NYL) action yesterday at the Constantine Park in Macoya. Photo: Crown Trace attacker Jevaughn Humphrey (second from right) was a handful against FC Santa Rosa in Republic Bank National Youth League action on 11 June 2016 in Macoya. 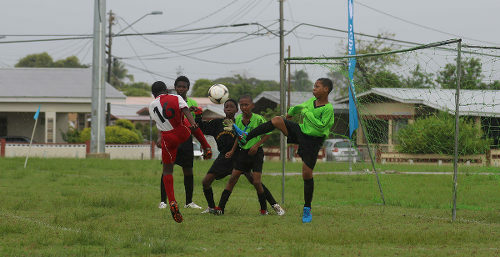 Humphrey scored one and set up another as Crown Trace won 3-0 the East Zone Under-16 fixture. Maybe nobody in Central wanted to play them. 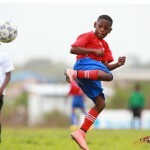 Theirs was the crowning performance of an enthusiastic day’s football in Macoya, as the zone’s top teams began to lift their heads above the crowd in the truncated competition. Santa Rosa might have a tough afternoon in the under-16 division. 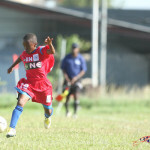 But, at Under-14 level, the little “Big Cannons” remained at the helm with an emphatic 5-1 win over Pinto United SC. Mikel St Martin grabbed a double for Santa Rosa, who scored three goals in the final three minutes through Isaiah Richardson, Nathaniel James and Keyel James. Richardson, who scored Santa Rosa’s winner over Adrenaline FA last week, has scored in each of the two rounds for his club. 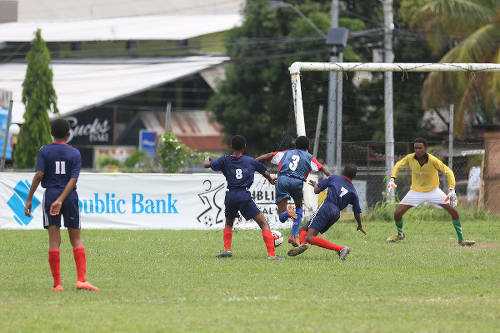 Photo: Malabar Young Stars attacker Jorel Grant (centre) squeezes between Mafeking United players Tamaar Williams (second from left) and Kirby Stewart (second from right) while goalkeeper Marc Mahabir gets ready during Republic Bank National Youth League action on 11 June 2016. There was more heartache for Adrenaline yesterday against San Juan Jabloteh, as the boys from Bourg Mulatresse maintained their 100 percent record in this division. Adrenaline were tardy and the Jabloteh starting team spent over 20 minutes in the drizzle, knocking the ball around, as they waited for their opponent. 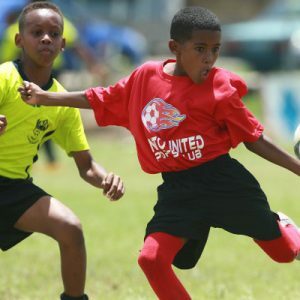 Pint-sized attacker Kaihim Thomas avenged Jabloteh with the winner, three minutes before halftime, as he followed up on a firm shot from DeShaun Strong, which was parried by Adrenaline goalkeeper Daniel Warner. It was enough to keep Jabloteh ahead of Santa Rosa on goal difference, after two games. Although, with Jaheim Marshall humming in central midfielder, coach Anthony “Dada” Wickham’s troops should surely have managed a more comfortable result. In the Under-12 Division, Malabar Young Stars showed their promise, as they peppered the Pinto United goal before easing to a 3-0 win. 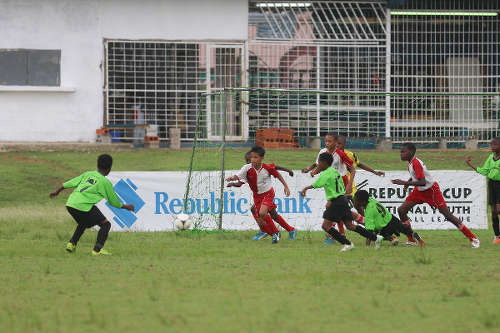 Photo: Action between San Juan Jabloteh (red and white shirts) and La Horquetta XF in the Republic Bank National Youth League Under-12 division on 11 June 2016. Tayshaun Cummings put Malabar ahead in the fifth minute. But it was not until the second half that they got an insurance item, courtesy of a crisp strike from the edge of the area by Ryan Castillo. And Jemaul Ashing rounded off the score summary with a 37th minute strike in the 40-minute contest. Spare a thought for chubby Pinto custodian Donnell Thomas, who was arguably the outstanding player on the field, and his brave defender, Sherwin John, who resisted the Malabar attack for as long as they could. “This weekend it’s like: Wow, I don’t know what to say,” said Pinto coach Dexter Hoyte. “The children just were not in their game. But it does happen. It does happen. 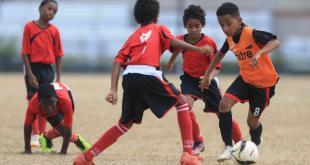 Abdullah took the Malabar Under-12s to the verge of a knockout spot last year. This season, with Ashing buzzing on the offensive end, he hopes his Young Stars have the quality to go a step further. Crown Trace coach, Griffith, was happy to share his dream of a trophy too, albeit just one game into the season. 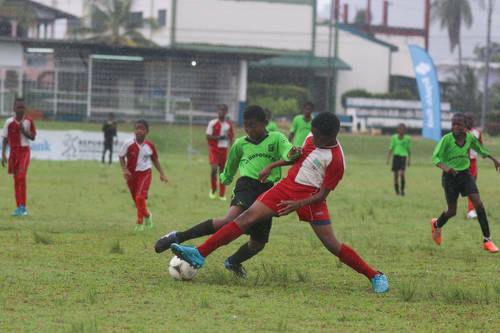 Photo: Crown Trace midfielder Dylon Roseman (right) controls the ball under pressure from a FC Santa Rosa player during Under-16 action on 11 June 2016 in the Republic Bank National Youth League. Their clash with Santa Rosa demonstrated decent ball movement and compactness from both sides. 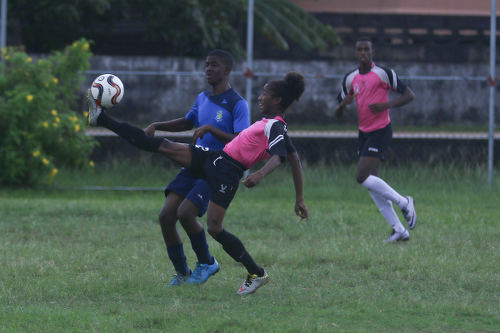 But Crown Trace, with Trinidad and Tobago National Under-17 attacker Jevaughn Humphrey always involved, had too much quality. “I think we played good football,” said Griffith, who shot to prominence two years ago when he won a FIFA award for social work. “They practised it but I didn’t expect them to be so consistent. Because you know kids—you give them a plan and they tend to stray sometimes. The towering Humphrey got around his opposing full back and crossed for Kemuel Hagley to dart in off the right flank to convert, in only the fifth minute. 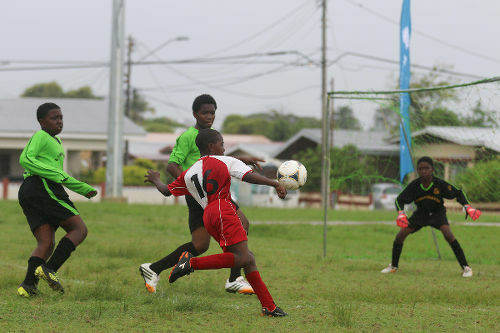 The young “Soca Warriors” midfielder then doubled Crown Trace’s advantage, midway through the first half. And, for all Santa Rosa’s gusto, they could not claw their way back into the match. 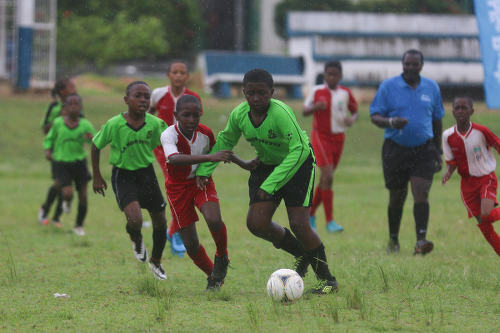 Humphrey was too much for Rosa, though, as he clipped the bar off another mazy dribble in the second half, before a strike by Crown Trace midfielder Johnathon Richards extinguished any hope their opponents may have had for a comeback. Crown Trace are on the trail of higher honours. 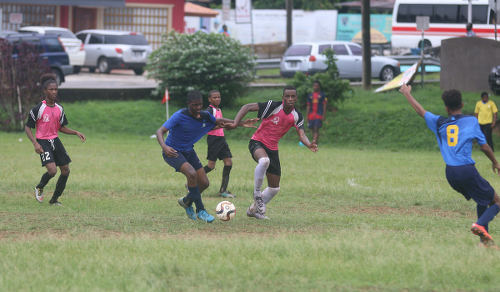 The Central Zone outfit has been training for three days a week since March, as they prepare for the Disney Cup International tournament in Orlando, Florida. 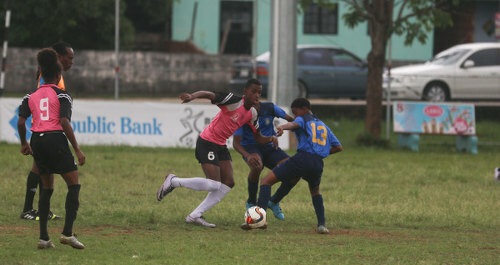 Photo: Crown Trace attacking midfielder Jevaughn Humphrey (centre) takes on the FC Santa Rosa defence during Republic Bank National Youth League Under-16 action on 11 June 2016. Griffith led Crown Trace to the Under-19 title last season, which was a maiden honour for a local club. They will participate in the Under-16 Division there this time. The late start of the Republic Bank youth tournament means Crown Trace might be forced to choose between the two competitions at some stage. Naturally, the players are excited at the prospect of an overseas adventure. Griffith laughed as he said it. Yesterday’s performance was enough to put any coach in a good mood. Malabar Young Stars 4 (Jorel Grant 8, Jahmali Clarke 22, Brandon Bobb 37, Aliston Lewis 47), Mafeking United FC 0.